The first Rockhampton prison, built in 1864 on land bordered by South and Murray streets, was in serious disrepair by the late 1870s and had insufficient space for female prisoners, and so a brand new prison was planned. This was built on North Street during 1878-79 by contractor John Ferguson (tendered at £10,475), but the warders' quarters were not completed for another five years, so the facility was not officially proclaimed as a prison until 16 September 1884. Serving inmates were transferred from the old prison during that month. The new Rockhampton prison was set on two acres and surrounded by a 6-metre-high brick wall on a plinth of sandstone and concrete foundations. On either side of the main entrance were the staff quarters, leading into a central court planted with ornamental shrubs. 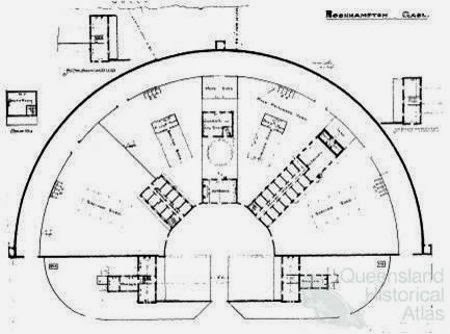 The internal buildings were built according to the popular ‘radial’ design, spanning around in a semi-circle to front onto the court area. 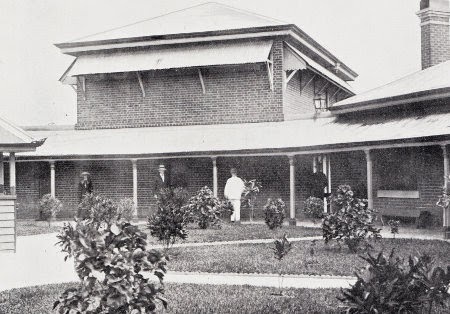 The front of Rockhampton Prison, c.1913 (BRGHS). On one side of this court was the male cellblock, containing 13 whitewashed single cells on the ground floor and an ‘associated ward’ with dormitory space for 30 men upstairs. During the 1880s the cell beds consisted boards on trestles and no mattresses were supplied, although inmates got four blankets in summer and five in winter. At the end of the wing was a one-storey building containing solitary cells and the hospital. The solitary cells, used for punishment, measured just 2 metres by 2.3 metres and were ventilated by a 30cm-square grating. The air in these dark pits was described as being ‘musty and heavy, and far from healthy’. On the other side of the court was the female wing. It had nine single cells and an associated ward for up to 20 women, although the numbers of female inmates rarely reached double figures. In charges of all these inmates were the chief gaoler, head warder, five male warders and one female warder. Prisoners sentenced to more than 12 months were sent to Brisbane or St Helena Island so the prison was rarely crowded, although there were two occasions when it was filled well beyond capacity. The first was in 1891 after the arrest of over 100 prisoners during the shearers’ strike of 1891. 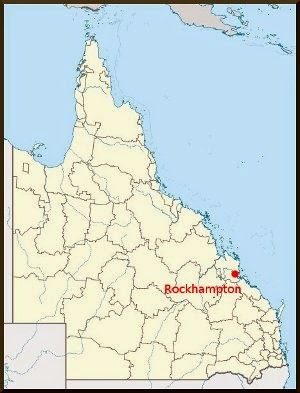 The second was during WW2 when U.S. troops were stationed in Rockhampton, and over 200 men were reportedly held in the prison at one time, mostly for minor offences. In 1887 Rockhampton was the only prison in the colony to still be using shot drill as punishment in lieu of hard labour, but in later years the prisoners made brushes, brooms and coir mats. 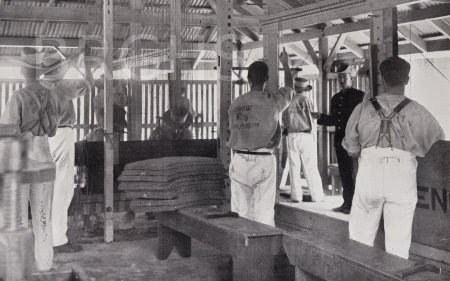 Mat shop, Rockhampton Prison, c.1913 (BRGHS). The prison hosted one execution, that of Rockhampton wife-murderer Michael Barry in 1890. This was the only hanging to ever be conducted outside of Boggo Road after that prison had opened in 1883. 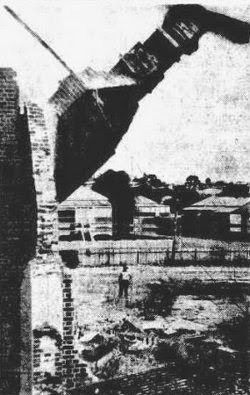 The prison is demolished in 1947 (Morning Bulletin). The small number of inmates held at the prison during the 1930s led to the rather confusing reclassification of the building from being a prison to a 'gaol' in November 1939. This meant that it could only hold prisoners sentenced to 30 days or less, although in reality it had already been used in that way for several years anyway. It was, in effect, a police gaol that was still under the control of the prisons department. This changed when the adjoining police watchhouse on Bolsover Street was extended with the addition of new cells to accommodate up to 20 prisoners, allowing the older North Street Rockhampton to be demolished in 1947. The Bolsover Street facility - now Rockhampton's third prison - was proclaimed to be a police gaol in May 1948 (coming under the control of the police department), so ending the era of the early Rockhampton prisons. 20 years later, however, another prison was to open in Rockhampton, and today the Capricornia Correctional Centre, 20 kilometres north of the city, continues the penal presence in the region. The Bolsover Street gaol, 1947 (Morning Bulletin).